I'm posting this photo to test my new Flickr account. It is from a photo collection of captive snake holes and tunnels that I've taken. Thats a fresh hole there. If he wants to keep it in a week or so it will be what I call a Pretty one from him using it and a nice packed track forms. This is why I like aspen but, I kind of wish I had a more native alternative for such a dominant element in the enclosure. He has outgrown the slate box and most of the cork hollows so I think thats why he is being extra industrious in the aspen. The round 'burl' you see buried on the right of the hole has an open side that the hole turns into and out the other side is another opening where he 'cleared out' a compartment of sub. 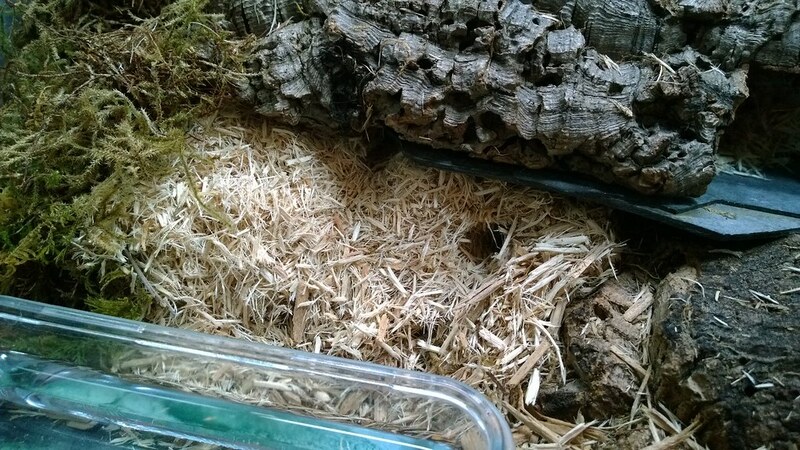 There are various tunnels at different aspects that he lays in corresponding to the warmth gradient penetrating the sub from a UTH on the wall. Thank for letting me share. think its interesting and maybe some other people might too.